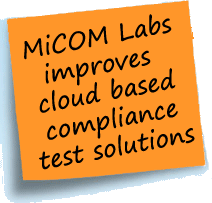 Boonton – The 55 Series USB Power Sensor used by MiCom labs, a full compliance service provider, improves cloud based compliance test solutions for WiFi 802.11ac MIMO Devices. Boonton, a Wireless Telecom Group company (NYSE: WTT), has helped MiCom labs decrease regulatory compliance costs and testing time with the 55 Series USB Power sensor with Real-Time Power ProcessingTM technology.By developing the MiTestTM System, an automated cloud based test system and test methodology MiCom has enabled end-to-end automation of conducted regulatory compliance testing using Boonton’s 55 Series USB sensor. The new automated test procedure requires simultaneous and synchronized RF power measurements by using multiple power sensors with a multiport RF Switch.